Prehistoric Bison Bones in a Polk County display. T he UWZM maintains exhibits on the first and second floors of the L.E. Noland Zoology Building and on the B1 level of Birge Hall, accessible during open hours. Exhibits are created by students participating in Museum internships. The UWZM also participates in outreach presentations at other venues. Left, Museum Artist Kandis Elliot prepares a dinosaur for a children’s exhibit at the Henry Vilas Zoo. On campus, hallway displays and exhibits are the only public spaces available to the Museum. Requests for public tours of the Museum research collections cannot be accommodated at this time. The UWZM currently has an exhibition at the Polk County Historical Society Museum in Balsam Lake, Wisconsin. 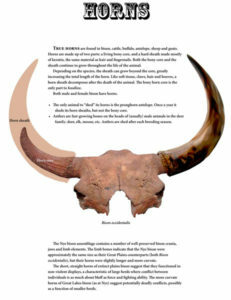 You can see the skull of an extinct Bison occidentalis on loan to the Sauk Prairie Area Historical Society Tripp Heritage Museum. 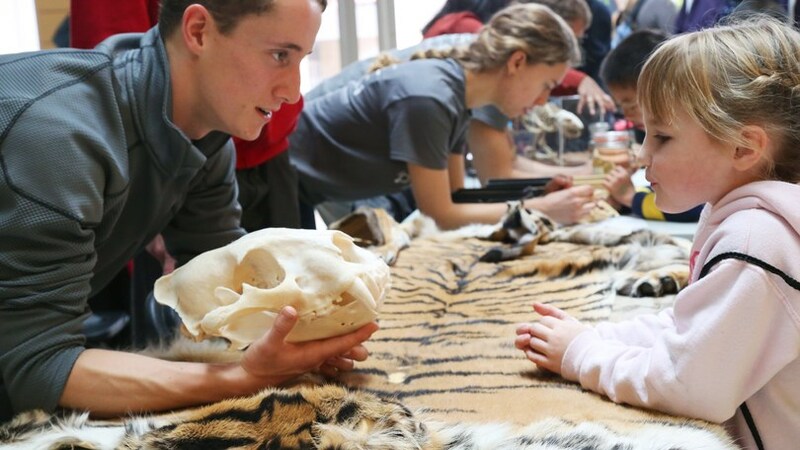 The UWZM participates in campus events like Science Expeditions in the spring and The Wisconsin Science Festival in the fall. We also partner with the Biocore Outreach Ambassadors to provide public programming at campus science events and at after-school science nights. Specimens may be borrowed by qualified individuals or organizations for other outreach events. Requests for borrowing specimens must be submitted at least two weeks in advance; teaching and outreach resources are limited and not all requests can be accommodated. Photo taken at the 2014 Wisconsin Science Festival, depicts Joseph Ogrady and Alina Zdechlik with visitors. Courtesy of the Morgridge Center.